Hipsters Dont Dance & Swing Ting Present World Carnival from Hipsters Dont Dance on Vimeo. 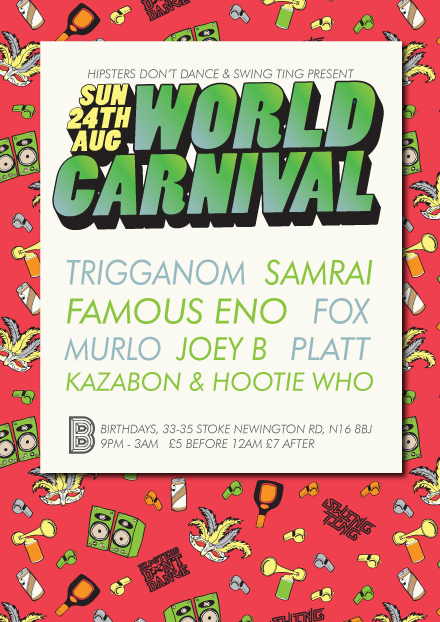 If you missed our collab with Swing Ting on Carnival Sunday check out what you missed above. If you were one of the may ravers who joined us palancing and skanking see if you can spot yourselves. It was such an amazing night and this video by Akito Hernshaw of Hub 16 definitely captures the vibe. Thanks again to Fox, Trigganom, Famous Eno, Murlo, Samrai, Joey B, Platt and Birthdays for helping us make it all happen. This year we are happy to announce we are teaming up with Manchester’s Swing Ting crew for our annual World Carnival party.We (Kazabon & Hootie Who) will be repping the HDD flag at Birthdays on Carnival Sunday with Loughborough’s baddest export and HDD resident; Murlo. 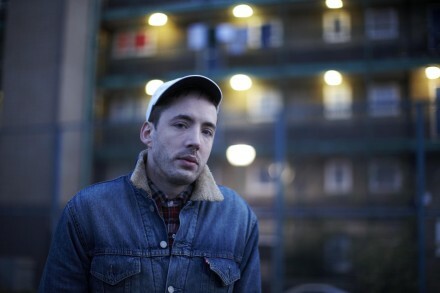 Joey B aka Lord Swang will be decked out in a white tee repping Swing Ting, joined by dusty-fingered soundboys Platt & Samraialongside MC/singjay/vibist, the honourable Mr Fox. Extended family Famous Eno & Trigganom feature as special guests, hot off blazing down sessions from London to Leeds. Expect Eno’s ruffneck productions to be ridden with ferocity by Mic-magician Trigganom. Bawl out! All keen, lean, dancehall kings and queens, witness the combination of these two teams! Get £3 early bird tickets here (while they last). HDD Fam Murlo and Famous Eno recently joined forces and released their Aerial collabortation on Mixpak which has been getting love from Brackles, Scratcha DVA and Visionist and has Spooky on the offical remix. 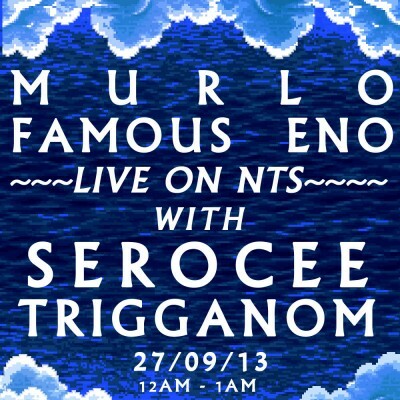 While the pair are on a grime tip they are taking over the 12am – 1am spot on NTS tonight with Serocee and Trigganom on mic duties. 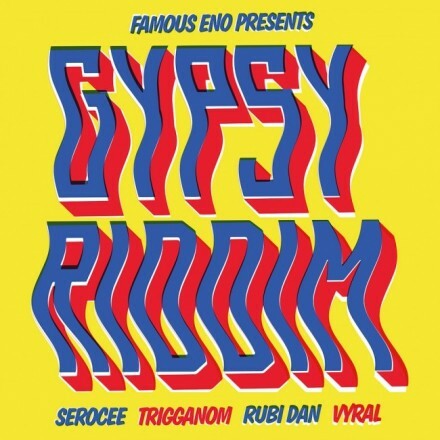 We were lucky enough to get a sneaky listen to some riddims that Famous Eno, Serocee and Trigganom have been working on and they are pure fiyah! So be sure to tune in online to NTS for their takeover. This Saturday we are joined by one of our favourite DJs and producers Famous Eno, for our May Session at Meter. So in preparation we asked him for five minutes of his time to tell us a little bit about himself and what he has been working on. Who are you and how would you describe your sound? My name is Eno. I live in London and make music.. I suppose my sound is minimal club music.. I am influenced by old school jungle/drum and bass, dancehall, grime, hip hop, bmore club and anything with a vibe! I love working with vocalists and I love pop tracks that sound weird! Really exited about this. All Good FM is one of the last of the true pirates. The listener has the good fortune of tuning into it for 3 or 4 minutes before they loose the signal. The video is just finished, it features remixes from DJ sliink, Arveene and Misk, Morcee, and me! it also features a good friend of mine MC Stitch on vocals. 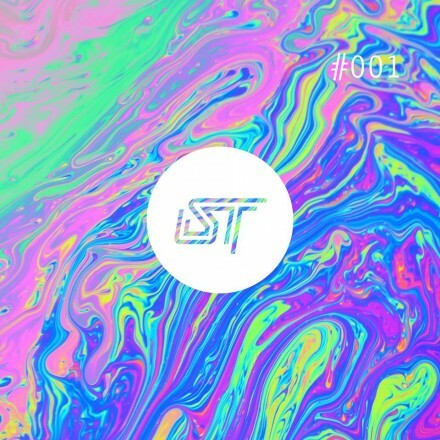 Stitch used to M.C at a jungle night I used to run about 10 years ago, so its cool to finally do a track with him. Planning on a June release for this one I think so keep your eyes and ears peeled! As you mentioned, your new single is called All Good Fm what are your favourite radio shows? I’m probably going to play a lot of classic grime, really in love with this sound at the minute.. some dancehall and some new tracks from me.. also expect lots of rewinds! I’m looking forward to Murlos set! Music that makes people dance (hopefully). I have a lot of new tracks im working on which im exited about.. collabos with Serocee, Trigganom, and some vocalists I cant mention, Last Japan, Murlo and some really weird stuff of my own! also, I just bought a Moog slim phatty so plan to make some beats with that and a borrowed 808 and see where that takes me!